Exterior view of the old gymnasium in Bryn Mawr College. The front of the building is visible. The photograph was taken from the ground in front of the gymnasium. Most of the building is covered in ivy. A flag with "1905" written on it hangs on the front side of the building. Four students, dressed in long skirts, are visible outside the building. Two student stand taking on the steps. One sits by the stairs reading. The other stands in front of the steps. 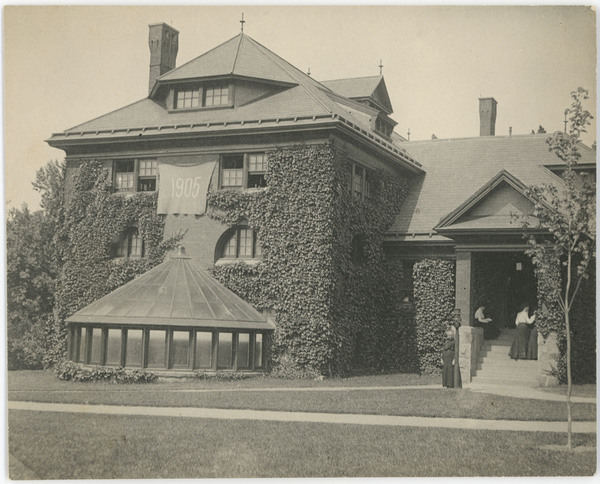 Broadbent Company, “Students outside the old gymnasium,” The Albert M. Greenfield Digital Center for the History of Women's Education, accessed April 24, 2019, http://greenfield.brynmawr.edu/items/show/2711.